"Quick and easy! In our family, this is a holiday favorite. We make it for every Christmas, Thanksgiving, and Easter dinner." 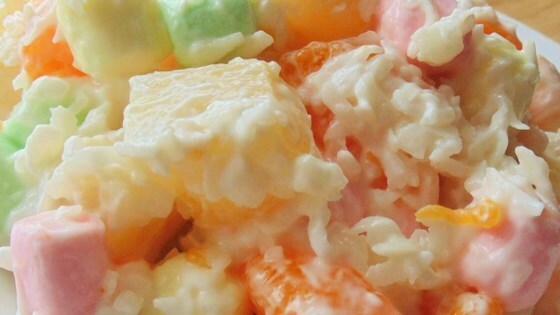 Mix sour cream, coconut, marshmallows, and pineapple together in a bowl; garnish with mandarin oranges. Cover bowl with plastic wrap and refrigerate 8 hours to overnight. A fruit and romaine salad with a tangy lemon and poppyseed dressing. This makes a delicious very simple recipe ....so easy to make and tasty....My Favourite....Thank you.. I also added canned peaches and it was a hit! I use vanilla Greek yogurt instead of sour cream. I made this for Easter and my family loved it! Go for the double recipe if taking to a potluck or it won't be enough. Will make again. Yum. Super easy to prepare and very tasty. This will become a tradition for Easter at our house. Love it!